Asphodel is a in-development comic about several kids living through different sides of a fantastical interpretation of the Medieval Era in the Middle East. It is written by Ben Schiffler and drawn by Zixing Guo. You can view development updates online at asphodelcomic.com. 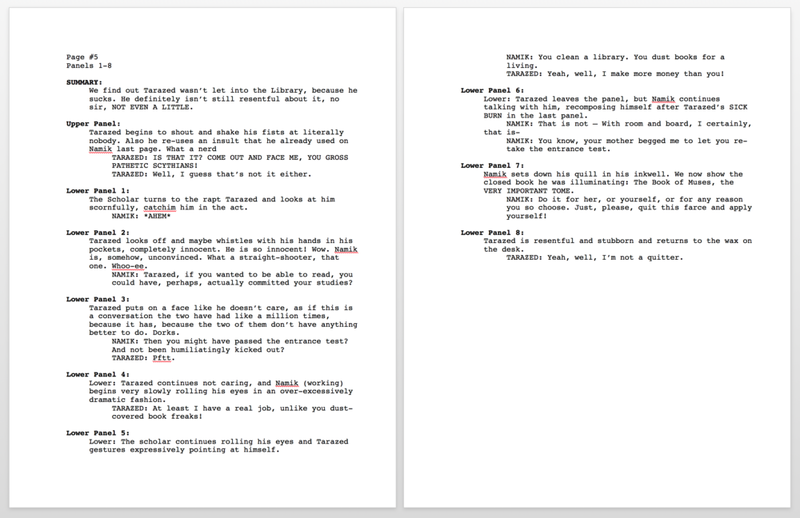 This is an example final script for page 5 of Asphodel. I write several drafts and work alongside Zixing to get them working as well as possible before moving them into thumbnails. The same process occurs with the thumbnails in reverse. Zixing takes the script and draws out loose drafts which I then critique and give notes about. Once the thumbnails are complete, Zixing takes the page and illustrates it. though I sometimes flat out the comic or assist in other parts of the process.